Dimenzije: 30,50 x 23,50 cm. Hrvatska mala škola “sv. Josipa” - Album – izbjeglički logor Fermo. This book-Album is a high quality reproduction of two albums from the post-World War II refugee camp located in Fermo, Italy. Thee albums contain original photos of the school children, their life in the camp and daily activities. Their teacher, Mrs. Marija Ramljak, who made the albums, also wrote the heart-moving text that accompanies the black and white photographs taken by the well- known Croatian photographer, August Frajtić. 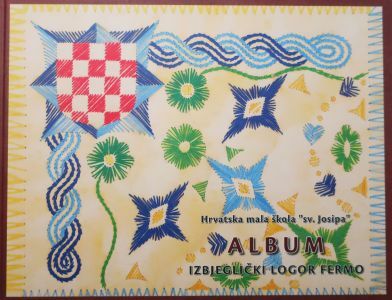 The original Albums are kept at the Croatian Ethnic Institute in Chicago. Ante Čuvalo prepared this valuable edition and wrote an introduction that provides a general background on the refugee camp of Fermo. Jelavich, Charles: Južnoslavenski nacionalizmi: jugoslavensko ujedinjenje i udžbenici prije 1914.